I recently made a whirlwind trip to North Arkansas and then on to Kentucky to visit my sister and her family, my brother and my Mom. While I was there my nieces introduced me to all kinds of things I never knew anything about. Of course, I know about Minecraft, but since talking with Mounds I have a whole new level of the things I know. I also learned about "squishies" and Kid Snippets from Almond Joy which you can learn about if you look them up on YouTube. It was all so much fun, but not nearly enough time. We did at least have time to go shopping . . . duh, Mrs. Claus and Santa never forget to go shopping. . . They are both growing up faster than I imagined. I am sure their mom and dad are equally amazed sometimes. If you don't know my sister you should read her interview from a few years ago in this post. The girls were really excited to see all of Reese's "Inktober" drawings that she has been posting. Since Reese's switched to be an art major she has been doing a lot more drawing and one thing she has been doing for fun is drawing ink pictures, one for each day in October, aka: Inktober. Mounds asked for a picture of "fluffy pants" her stuffed penguin.
. . . which Reese's drew, snapped and sent back in about 15 minutes. Ta da!! Then Almond Joy asked for a picture of all her friends, but Reese's explained that it would take too long as she has to post one for each day. 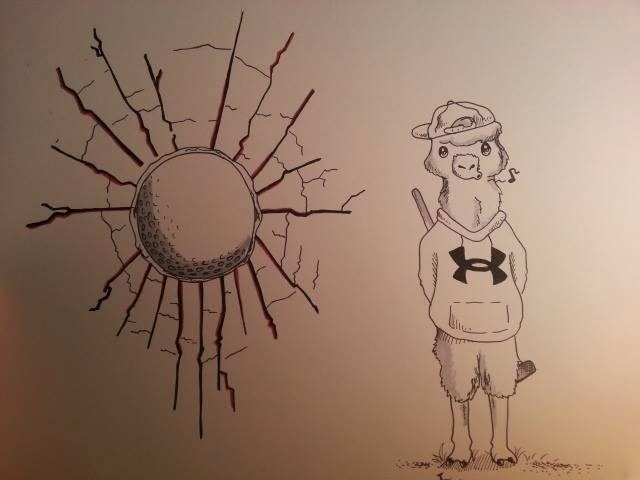 So Almond Joy asked for a picture that included an alpaca, a golf ball, a heart and an Under Armour logo. . . . which means something to all her friends. So . . . .
uh, yeah. (Did you see the heart? It's kind of subtle.) You are welcome! If you want to see more Inktober pictures, click here. Great Inktober drawings and your nieces are lovely. Glad you had a good visit with them. ADORE the little penguin! 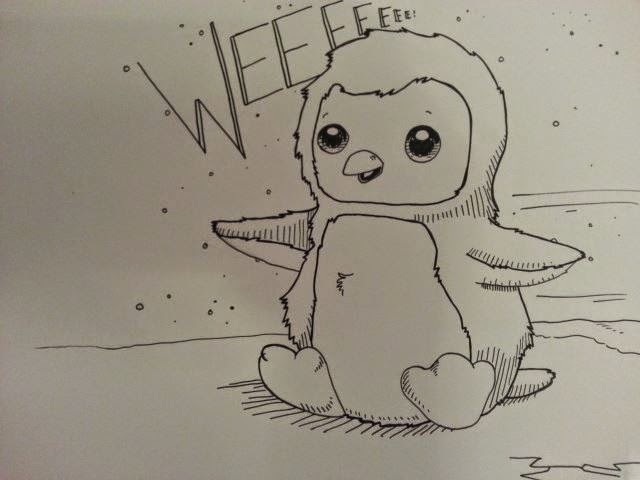 Penguins are my son's favorite animals...so I have a real soft spot! How nice it was for you to spend time with your family! I love the penguin drawing ~ totally cute! My SIL loves penguins. I think he would like this image a lot. lol Honestly, I did not spot the heart in the second drawing even after zooming in. Where is it? Happy #WW! The shape of the cracked glass around the golf ball. . . . very subtle, huh?